The Seeliger effect is very clear. An 8" SCT fitted with a 0.6 focal reducer was mounted on a GOTO HEQ5 mount. 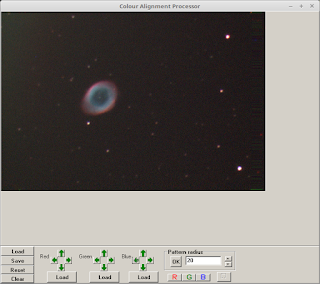 The mount was quickly polar aligned and 3-star aligned, and sent to M57. Everything was done quickly in Astronomical twilight before the Moon was substantially risen. 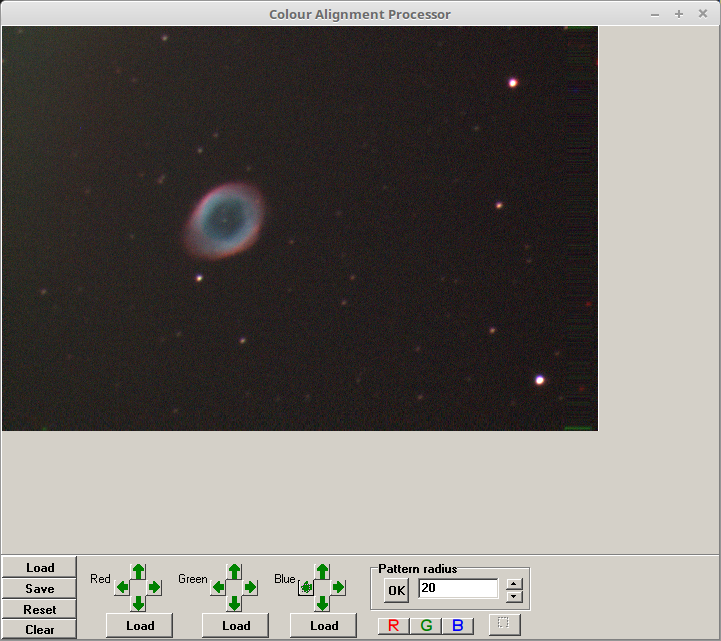 Nicola's AstroDMx Capture for Linux was used to control the camera and capture the images as well as remotely controlling the ZWO filter wheel. 30s exposures were captured. 20 luminance images were captured through an IR/UV cut filter, and 10 images were captured through each of the RGB filters. Dark-frames were also captured. 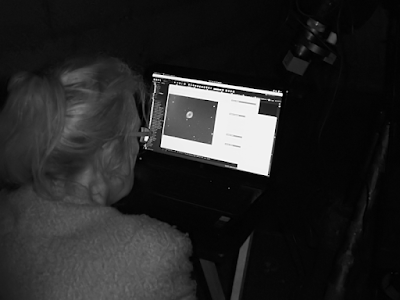 Nicola capturing the image data. 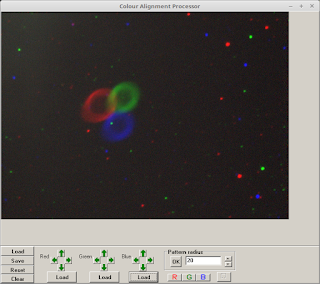 The images were stacked in Autostakkert 2.6 and the RGB images were automatically combined in Andrew Sprott's Colour Alignment Processor (AutoCAP). The first release of AstroDMx Capture for Linux will have manual control of the ZWO filter wheel. Later releases will have fully programmable filter wheel control and image capture, and subsequently control of all ASCOM compliant filter wheels. Scopes were mounted on an iOptron Cube Pro, AZ, GOTO mount. A CaK PST scope was used with a DMK 21AU04.AS camera. 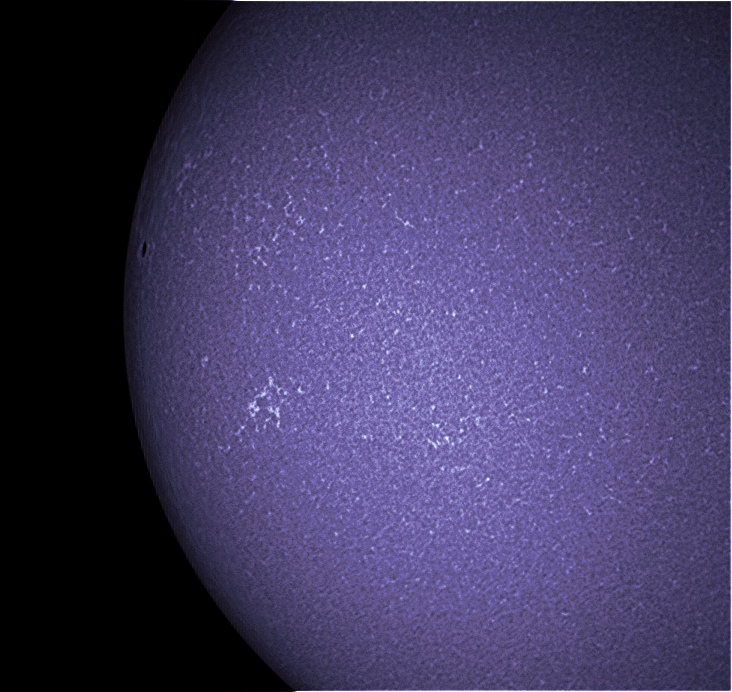 Nicola's AstroDMx Capture for Linux was used with a Linux Mint laptop to capture a 500 frame SER file of part of the solar disk, showing an emerging sunspot on the limb and some weak chromospheric network activity. The bet 90% of the images were stacked in Autostakkert! 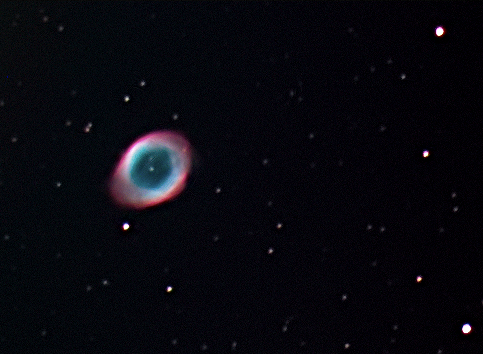 2.6, using 1.5 drizzle, wavelet processed in Registax 5.1, and processed in the Gimp 2.9. 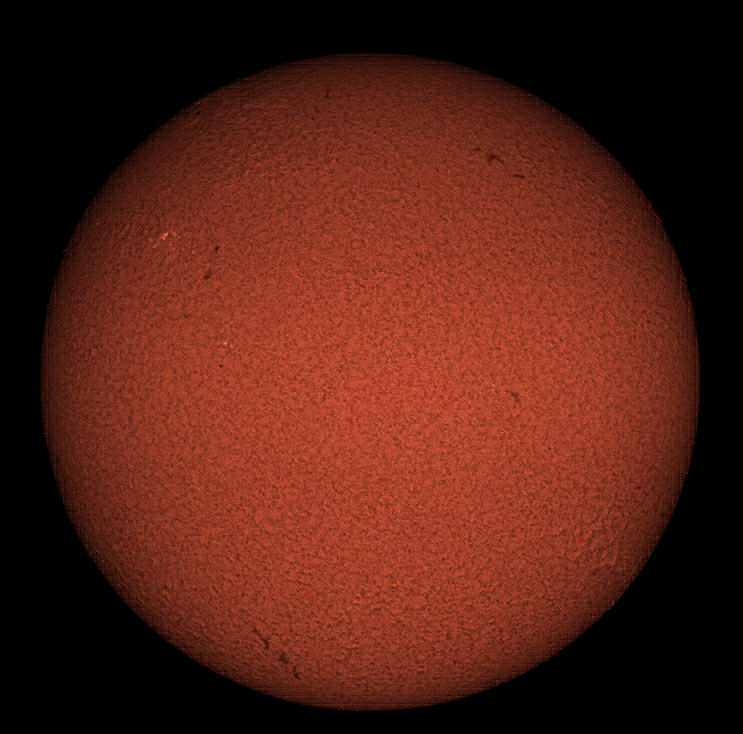 A Solarmax II, 60, BF15, H-alpha scope was used with a DMK 21AU04.AS with a x2 Barlow lens on the camera adapter. 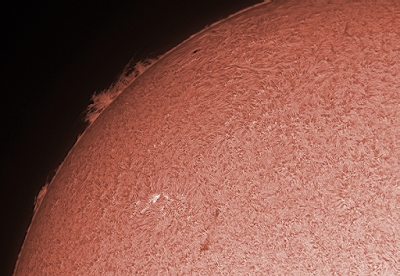 AstroDMx Capture for Linux was used to capture two 5000 frame SER files of part of the solar disk, showing an emerging sunspot on the limb and a hedgerow prominence. One file was exposed for the prominence and the other for the solar disk. The best 50% of images in the SER files were stacked in Autostakkert! 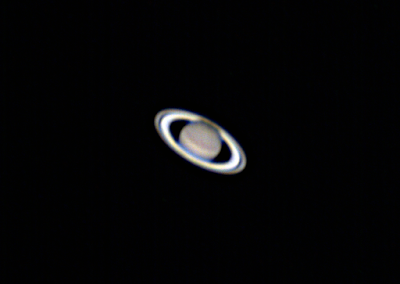 2.6, wavelet processed in Registax 5.1, and processed in the Gimp 2.9. The two resulting images were then combined in the Gimp 2.9 to produce the final image. 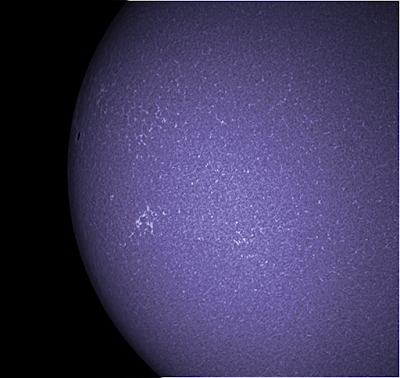 Four overlapping quadrants of the Sun were imaged in H-alpha, capturing 1500 frame SER files with AstroDMx Capture for Linux. The resulting images were stitched in Autostitch in Wine, wavelet processed in Registax 5.1 and processed in the Gimp 2.9. Swansea Astronomical Society talk to and present a telescope to the New Barry Astronomical Society. More power to astronomy in South Wales. 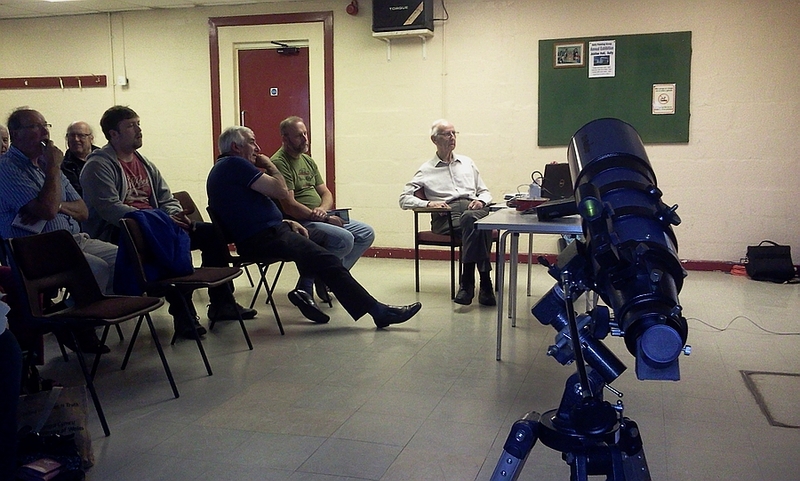 The astronomical societies of South Wales, UK, have never considered themselves as rivals, indeed, they frequently work together in public astronomical events. Last night, Brian Stokes the previous chairman of the Swansea Astronomical Society (SAS) gave a talk to the Barry Astronomical Society (BAS) on 'The Wonderful world and Universe', a variation on a talk that he presents to schools as part of SAS outreach. 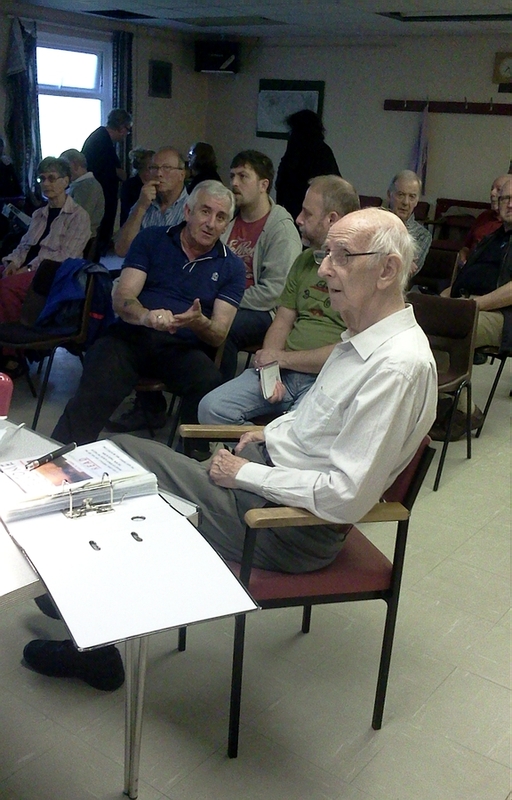 Barry Astronomical Society is just one year old and was founded by Dave Powell MBE. Brian Stokes presented BAS with a 102mm refractor on an equatorial mount on behalf of the SAS, to start BAS off with a portable scope for the society. Photos from the meeting, which, as always, was well attended. 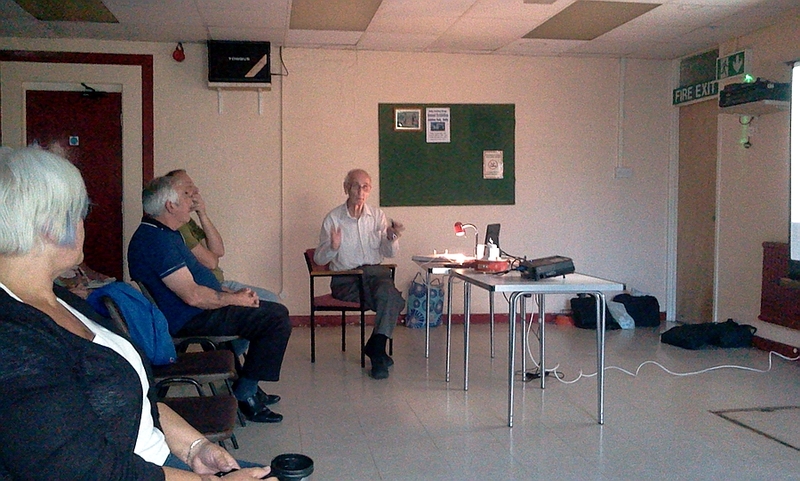 The SAS and BAS provide each other with speakers, maintaining the tradition of cooperation between the astronomical societies of south Wales.